Speaking to a group of reporters in Italy this morning, Ferrari chairman Luca di Montezemolo made a few "promises" about the brand's direction: production will be kept limited, and engines will remain powered by gasoline. As Yahoo! Autos' Justin Hyde reported this morning, di Montezemolo had this to say about pressure to produce an electric sports car: not on my watch. "We will never manufacture an electric car as long as I'm chairman." This is good news for anyone who is a fan of the way the company's screaming V12 engines sound. 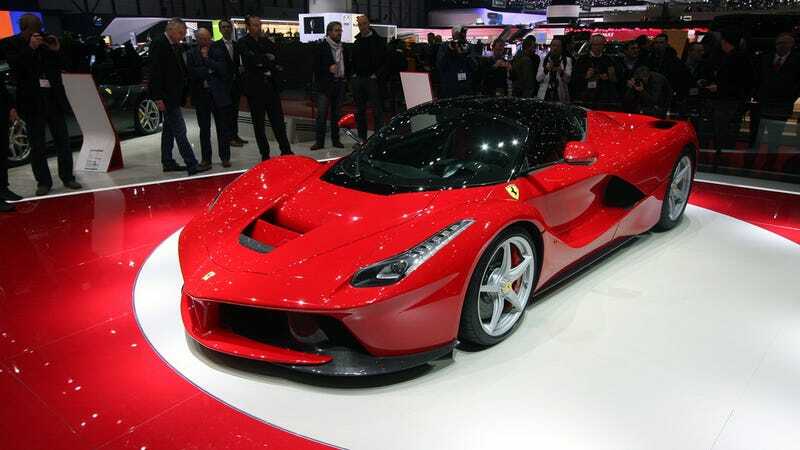 Of course, di Montezemolo only means purely electric cars, as the company's new halo car LaFerrari has a hybrid engine good for 963 horsepower. Notice that I had the word "promises" in quotations above. That's because experience has taught us to not take automakers on their word when they make promises about future products. There was a time when BMW bragged about not using front-wheel-drive on their cars, and now the next 1-Series will have a front-drive variant. So maybe an electric Ferrari won't happen in di Montezemolo's term, but that doesn't mean it won't under some other chairman. I can't say I'm a fan of the idea myself, but if that's the way things go, Ferrari will have to adapt. "Ferrari is like a beautiful woman," Di Montezemolo said. "You must desire her, you must wait for her." Sources say that di Montezemolo then gave members of the automotive press a 20-minute lecture on the art of seduction.